This is a highly specialized instrument, all it does is measuring low ohm range resistance (from 200mΩ to 2000Ω in five ranges) and nothing else. The meter came with a rugged case which is handy for field use, although its portability is hampered by the requirement of a wall outlet. 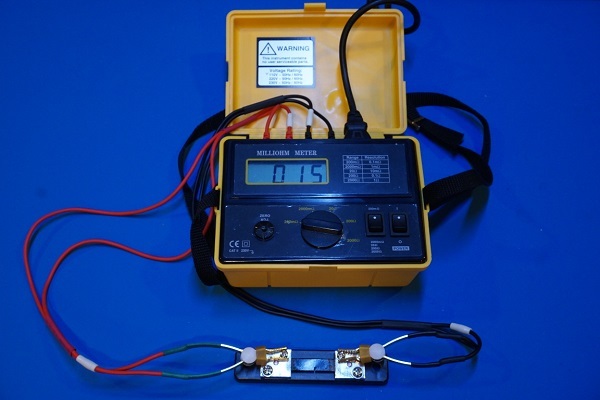 Since this meter is designed for low resistance measurement, it came with a set of 4 wire Kelvin clips. The stock leads are not my favorite though, as the design uses rubber rings to hold the two clip pieces together. One issue of this (instead of proper spring tensioned clips) is that the tension is quite weak and it is difficult to make secure contact with small dimension leads. Also, the rubber ring is likely to lose tension and fail over repeated use. This entry was posted on Wednesday, December 13th, 2017 at 11:57 pm	and is filed under Teardowns. You can follow any responses to this entry through the RSS 2.0 feed. You can skip to the end and leave a response. Pinging is currently not allowed.